Newborn boys with severe hemophilia may present with prolonged bleeding at circumcision. Easy bruising may occur at the start of ambulation or primary dentition. Older patients may have a history of hemarthroses and prolonged bleeding with surgical procedures, trauma, and dental extraction, and may have spontaneous bleeding in soft tissues. A traumatic challenge relatively late in life may have to occur before mild or moderate hemophilia is diagnosed. Factors that elevate FVIII levels (eg, age, ABO blood type, stress, exercise) may mask mild hemophilia. Weight-bearing joints and other joints are principal sites of bleeding in patients with hemophilia. The muscles most commonly affected are the flexor groups of the arms and gastrocnemius of the legs. Iliopsoas bleeding is dangerous because of the large volume of blood loss and because compression of the femoral nerve may occur. In the genitourinary tract, gross hematuria may occur in as many as 90% of patients. In the GI tract, bleeding may complicate common GI disorders. Bleeding in the CNS is the leading cause of hemorrhagic death in patients with hemophilia. Acquired hemophilia due to an autoantibody in previously hemostatically normal individuals tends to affect elderly persons who have comorbid conditions, but may also develop post partum. Persons with acquired hemophilia may experience extensive, often life threatening, bleeding before the condition is recognized. In contrast to persons with severe inherited hemophilia A, in whom joint bleeding is common, patients with acquired hemophilia present with large intramuscular, retroperitoneal, limb, subcutaneous, genitourinary, GI, or excessive postoperative or postpartum bleeding. Bleeding into an extremity can result in findings that are easily confused with deep vein thrombosis. Massive upper extremity bleeding can be precipitated by a simple venipuncture. Bleeding can develop at any site. Postpartum acquired hemophilia usually comes to attention 2 to 5 months after delivery, when bleeding symptoms supervene. Rarely, the inhibitor may develop during pregnancy. Approximately 30-50% of patients with severe hemophilia present with manifestations of neonatal bleeding (eg, after circumcision). Approximately 1-2% of neonates have intracranial hemorrhage. Other neonates may present with severe hematoma and prolonged bleeding from the cord or umbilical area. As children grow and become more physically active, hemarthroses and hematomas occur. Chronic arthropathy is a late complication of recurrent hemarthrosis in a target joint. Traumatic intracranial hemorrhage is a serious life-threatening complication that requires urgent diagnosis and intervention. Petechiae usually do not occur in patients with hemophilia. The reason is that petechiae are manifestations of capillary blood leakage, which is typically the result of vasculitis or abnormalities in the number or function of platelets. Hemophilia is classified according to clinical severity as mild, moderate, or severe (see Table 1, below). Patients with severe disease usually have less than 1% factor VIII (FVIII) activity and experience spontaneous hemarthrosis and soft-tissue bleeding in the absence of apparent precipitating trauma. Patients with moderate disease have 1-5% FVIII activity and bleed with minimal trauma. Patients with mild hemophilia have more than 5% factor activity and bleed only after significant trauma or surgery. Direct the examination to identify signs related to spontaneous bleeding, or bleeding with minimal challenge, in the joints, muscles, and other soft tissues. Observe the patient's posture. Examine the weight-bearing joints, especially the knees and ankles, and, in general, the large joints for deformities or ankylosis. Look for jaundice and other signs of liver failure (eg, cirrhosis), and for signs of opportunistic infections in patients who are HIV positive. Pseudotumors are produced by a slow expansion of repeated hemorrhages in bone or soft tissues. They can be restricted by the fascial planes of a muscle, cause resorption of neighboring bone by pressure-induced ischemia, or develop under the periosteum, leading to erosion of the bony cortex. They develop slowly over months to years and often are asymptomatic, unless pressure on the nerves or vascular compromise occurs. Pseudotumors contain a brownish material and can become infected. The buttock, pelvis, and thighs are common locations for a pseudotumor (see the images below). Transected pseudocyst (following disarticulation of the left lower extremity due to vascular compromise, nerve damage, loss of bone, and nonfunctional limb). 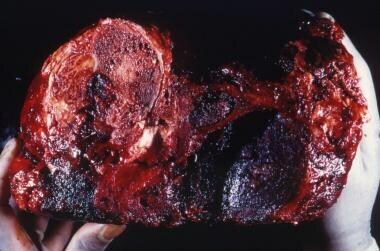 This photo shows black-brown old blood, residual muscle, and bone. Transected pseudocyst with chocolate brown-black old blood. 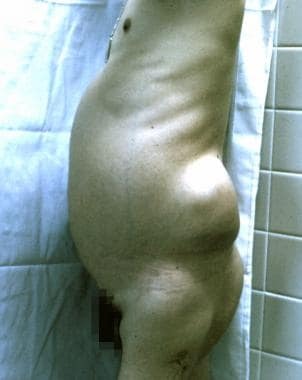 Photograph of a patient who presented with a slowly expanding abdominal and flank mass, as well as increasing pain, inability to eat, weight loss, and weakness of his lower extremity. 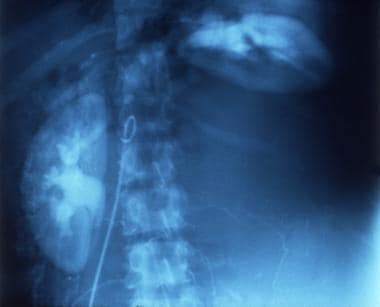 Intravenous pyelogram showing extreme displacement of the left kidney and ureter by a pseudocyst. 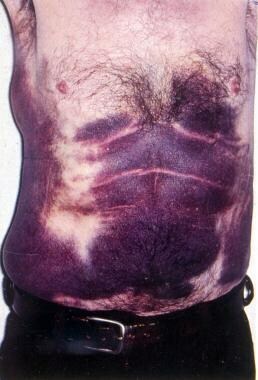 Photograph depicting extensive spontaneous abdominal wall hematoma and thigh hemorrhage in an older, previously unaffected man with an acquired factor VIII inhibitor. Peyvandi F, Garagiola I, Young G. The past and future of haemophilia: diagnosis, treatments, and its complications. Lancet. 2016 Feb 17. 3:15056. [Medline]. Federici AB. The factor VIII/von Willebrand factor complex: basic and clinical issues. Haematologica. 2003 Jun. 88(6):EREP02. [Medline]. Mudad R, Kane WH. DDAVP in acquired hemophilia A: case report and review of the literature. Am J Hematol. 1993 Aug. 43(4):295-9. [Medline]. Pinto P, Ghosh K, Shetty S. F8 gene mutation profile in Indian hemophilia A patients: Identification of 23 novel mutations and factor VIII inhibitor risk association. Mutat Res. 2016 Feb 10. 786:27-33. [Medline]. Gouw SC, van der Bom JG, Ljung R, Escuriola C, Cid AR, et al. Factor VIII products and inhibitor development in severe hemophilia A. N Engl J Med. 2013 Jan 17. 368(3):231-9. [Medline]. Peyvandi F, Mannucci PM, Garagiola I, El-Beshlawy A, Elalfy M, Ramanan V, et al. A Randomized Trial of Factor VIII and Neutralizing Antibodies in Hemophilia A. N Engl J Med. 2016 May 26. 374 (21):2054-64. [Medline]. Brown T. PRAC Confirms No Difference in Risk Between Hemophilia A Drugs. Medscape Medical News. Available at https://www.medscape.com/viewarticle/885146. September 01, 2017; Accessed: September 06, 2018. Klinge J, Auerswald G, Budde U, Klose H, Kreuz W, Lenk H, et al. Detection of all anti-factor VIII antibodies in haemophilia A patients by the Bethesda assay and a more sensitive immunoprecipitation assay. Haemophilia. 2001 Jan. 7(1):26-32. [Medline]. Bitting RL, Bent S, Li Y, Kohlwes J. The prognosis and treatment of acquired hemophilia: a systematic review and meta-analysis. Blood Coagul Fibrinolysis. 2009 Oct. 20(7):517-23. [Medline]. Kazazian HH Jr, Tuddenham EGD, Antonarakis SE. Hemophilia A and parahemophilia: deficiencies of coagulation factors VIII and V. Scriver CR, Beaudet AL, Sly WS, Valle D, eds. The Metabolic and Molecular bases of Inherited Disease. 7th ed. New York, NY: McGraw-Hill; 1995. 3241-67. Roelse JC, De Laaf RT, Timmermans SM, Peters M, Van Mourik JA, Voorberg J. Intracellular accumulation of factor VIII induced by missense mutations Arg593-->Cys and Asn618-->Ser explains cross-reacting material-reduced haemophilia A. Br J Haematol. 2000 Feb. 108(2):241-6. [Medline]. Spreafico M, Peyvandi F. Combined Factor V and Factor VIII Deficiency. Semin Thromb Hemost. 2009 Jun. 35(4):390-9. [Medline]. Hemophilia: Data & Statistics. Centers for Disease Control and Prevention. Available at http://www.cdc.gov/ncbddd/hemophilia/data.html. April 12, 2017; Accessed: September 6, 2018. Shetty S, Bhave M, Ghosh K. Acquired hemophilia a: diagnosis, aetiology, clinical spectrum and treatment options. Autoimmun Rev. 2011 Apr. 10(6):311-6. [Medline]. Di Michele DM, Gibb C, Lefkowitz JM, Ni Q, Gerber LM, Ganguly A. Severe and moderate haemophilia A and B in US females. Haemophilia. 2014 Mar. 20(2):e136-43. [Medline]. Anagnostis P, Karras S, Paschou SA, Goulis DG. Haemophilia A and B as a cause for secondary osteoporosis and increased fracture risk. Blood Coagul Fibrinolysis. 2015 Jun 26. [Medline]. Manco-Johnson MJ, Nuss R, Jacobson LJ. Heparin neutralization is essential for accurate measurement of factor VIII activity and inhibitor assays in blood samples drawn from implanted venous access devices. J Lab Clin Med. 2000 Jul. 136(1):74-9. [Medline]. Abdul-Kadir R, Davies J, Halimeh S, Chi C. Advances in pregnancy management in carriers of hemophilia. J Appl Hematol [serial online] 2013 [cited 2014 May 6];4:125-30. Available at http://www.jahjournal.org/text.asp?2013/4/4/125/127894. Accessed: May 6, 2014. Rodriguez-Merchan EC, De la Corte-Rodriguez H, Jimenez-Yuste V. Radiosynovectomy in haemophilia: long-term results of 500 procedures performed in a 38-year period. Thromb Res. 2014 Nov. 134 (5):985-90. [Medline]. Zanon E, Martinelli F, Bacci C, Zerbinati P, Girolami A. Proposal of a standard approach to dental extraction in haemophilia patients. A case-control study with good results. Haemophilia. 2000 Sep. 6(5):533-6. [Medline]. Oldenburg J, Mahlangu JN, Kim B, Schmitt C, Callaghan MU, Young G, et al. Emicizumab Prophylaxis in Hemophilia A with Inhibitors. N Engl J Med. 2017 Aug 31. 377 (9):809-818. [Medline]. [Full Text]. HAVEN 2 interim data. Presented at the 26th Congress of the International Society on Thrombosis and Haemostasis (ISTH) Meeting. Berlin, Germany. July 8-13, 2017. Oldenburg J, Levy GG. Emicizumab Prophylaxis in Hemophilia A with Inhibitors. N Engl J Med. 2017 Nov 30. 377 (22):2194-2195. [Medline]. [Full Text]. von Depka M. Immune tolerance therapy in patients with acquired hemophilia. Hematology. 2004 Aug. 9(4):245-57. [Medline]. Hay CR, DiMichele DM. The principal results of the International Immune Tolerance Study: a randomized dose comparison. Blood. 2012 Feb 9. 119(6):1335-44. [Medline]. [Full Text]. Franchini M, Mannucci PM. Inhibitor eradication with rituximab in haemophilia: where do we stand?. Br J Haematol. 2014 Jun. 165(5):600-8. [Medline]. Hitt E. Hemophilia: contact sports pose little risk. Medscape Medical News. Available at http://www.medscape.com/viewarticle/772326. Accessed: October 16, 2012. Leissinger C, Gringeri A, Antmen B, Berntorp E, Biasoli C, Carpenter S, et al. Anti-inhibitor coagulant complex prophylaxis in hemophilia with inhibitors. N Engl J Med. 2011 Nov 3. 365(18):1684-92. [Medline]. Mahlangu J, Powell JS, Ragni MV, Chowdary P, Josephson NC, Pabinger I, et al. Phase 3 study of recombinant factor VIII Fc fusion protein in severe hemophilia A. Blood. 2014 Jan 16. 123(3):317-25. [Medline]. [Full Text]. FDA approves the first antihemophilic factor, Fc fusion protein for patients with Hemophilia A. U.S. Food and Drug Administration. Available at http://www.fda.gov/NewsEvents/Newsroom/PressAnnouncements/ucm400167.htm. Accessed: June 17, 2014. Mahlangu J, Oldenburg J, Paz-Priel I, Negrier C, Niggli M, Mancuso ME, et al. Emicizumab Prophylaxis in Patients Who Have Hemophilia A without Inhibitors. N Engl J Med. 2018 Aug 30. 379 (9):811-822. [Medline]. Kumar R, Bouskill V, Schneiderman JE, Pluthero FG, Kahr WH, Craik A, et al. Impact of aerobic exercise on haemostatic indices in pediatric patients with haemophilia. Thromb Haemost. 2016 Feb 25. 115 (6):[Medline]. Matsui H. Endothelial progenitor cell-based therapy for hemophilia A. Int J Hematol. 2012 Feb. 95(2):119-24. [Medline]. High KH, Nathwani A, Spencer T, Lillicrap D. Current status of haemophilia gene therapy. Haemophilia. 2014 May. 20 Suppl 4:43-9. [Medline]. Sokal EM, Lombard C, Mazza G. Mesenchymal stem cell treatment for hemophilia: a review of current knowledge. J Thromb Haemost. 2015 Jun. 13 Suppl 1:S161-S166. [Medline]. Castellino AM. 'Promise of a Cure': Gene Therapy for Hemophilia A. Medscape Medical News. Available at https://www.medscape.com/viewarticle/889830. December 9, 2017; Accessed: December 12, 2017. Rangarajan S, Walsh L, Lester W, Perry D, Madan B, Laffan M, et al. AAV5-Factor VIII Gene Transfer in Severe Hemophilia A. N Engl J Med. 2017 Dec 9. 26 (1):1-16. [Medline]. [Full Text]. Rodriguez-Merchan EC, De La Corte-Rodriguez H. Radiosynovectomy in haemophilic synovitis of elbows and ankles: Is the effectiveness of yttrium-90 and rhenium-186 different?. Thromb Res. 2016 Feb 10. 140:41-45. [Medline]. [Guideline] Hanley J, McKernan A, Creagh MD, Classey S, McLaughlin P, Goddard N, et al. Guidelines for the management of acute joint bleeds and chronic synovitis in haemophilia: A United Kingdom Haemophilia Centre Doctors' Organisation (UKHCDO) guideline. Haemophilia. 2017 Jul. 23 (4):511-520. [Medline]. Bogdanova N, Markoff A, Pollmann H, Nowak-Göttl U, Eisert R, Wermes C, et al. Spectrum of molecular defects and mutation detection rate in patients with severe hemophilia A. Hum Mutat. 2005 Sep. 26(3):249-54. [Medline]. Broderick CR, Herbert RD, Latimer J, Barnes C, Curtin JA, Mathieu E, et al. Association between physical activity and risk of bleeding in children with hemophilia. JAMA. 2012 Oct 10. 308(14):1452-9. [Medline]. Brooks M. FDA OKs Turoctocog Alpha (NovoEight) for Hemophilia A. Medscape [serial online]. Available at http://www.medscape.com/viewarticle/812759. Accessed: February 29, 2016. Konkle BA, Kessler C, Aledort L, Andersen J, Fogarty P, Kouides P, et al. Emerging clinical concerns in the ageing haemophilia patient. Haemophilia. 2009 Nov. 15(6):1197-209. [Medline]. Tucker ME. FDA Approves Hemophilia Drug FEIBA for Bleeding Prophylaxis. Medscape Medical News. Available at http://www.medscape.com/viewarticle/818236. December 23, 2013; Accessed: September 06, 2018. Structural domains of human factor VIII. Adapted from: Stoilova-McPhie S, Villoutreix BO, Mertens K, Kemball-Cook G, Holzenburg A. 3-Dimensional structure of membrane-bound coagulation factor VIII: modeling of the factor VIII heterodimer within a 3-dimensional density map derived by electron crystallography. Blood. Feb 15 2002;99(4):1215-23; Roberts HR, Hoffman M. Hemophilia A and B. In: Beutler E, Lichtman MA, Coller BS, et al, eds. Williams Hematology. 6th ed. NY: McGraw-Hill; 2001:1639-57; and Roberts HR. Thoughts on the mechanism of action of FVIIa. Presented at: Second Symposium on New Aspects of Haemophilia Treatment; 1991; Copenhagen, Denmark. Photograph of a teenage boy with bleeding into his right thigh as well as both knees and ankles. Photograph of the right knee in an older man with a chronically fused, extended knee following open drainage of knee bleeding that occurred many years previously. Photograph depicting severe bilateral hemophilic arthropathy and muscle wasting. The 3 punctures made into the left knee joint were performed in an attempt to aspirate recent aggravated bleeding. Radiograph depicting advanced hemophilic arthropathy of the knee joint. These images show chronic severe arthritis, fusion, loss of cartilage, and joint space deformities. Radiograph depicting advanced hemophilic arthropathy of the elbow. This image shows chronic severe arthritis, fusion, loss of cartilage, and joint space deformities. 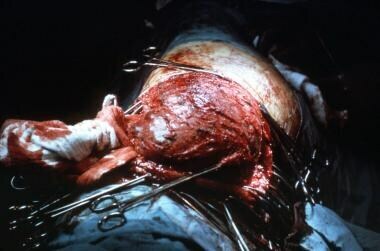 Photograph of a hemophilic knee at surgery, with synovial proliferation caused by repeated bleeding; synovectomy was required. 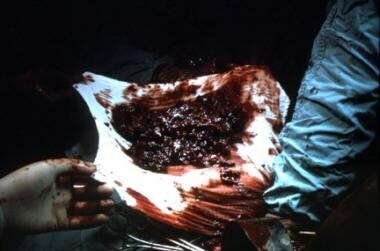 Large amount of vascular synovium removed at surgery. Microscopic appearance of synovial proliferation and high vascularity. If stained with iron, diffuse deposits would be demonstrated; iron-laden macrophages are present. Large pseudocyst involving the left proximal femur. 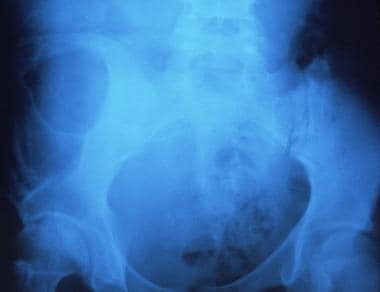 Magnetic resonance image of an extensive spontaneous abdominal wall hematoma and thigh hemorrhage in an older, previously unaffected man with an acquired factor VIII inhibitor. Disclosure: Received income in an amount equal to or greater than $250 from: Bayer, Octapharma, BPL, CSL Behring (Advisor Board Member). The authors gratefully acknowledge the provision of several photographs used in this article by a dedicated colleague from Chicago, Margaret Telfer, MD. The authors would also like to acknowledge Professor K.N. Subramanian (Department of Molecular Genetics, University of Illinois Medical Center) for general discussions relating to some aspects of the gene structure and mutation of the FVIII gene.